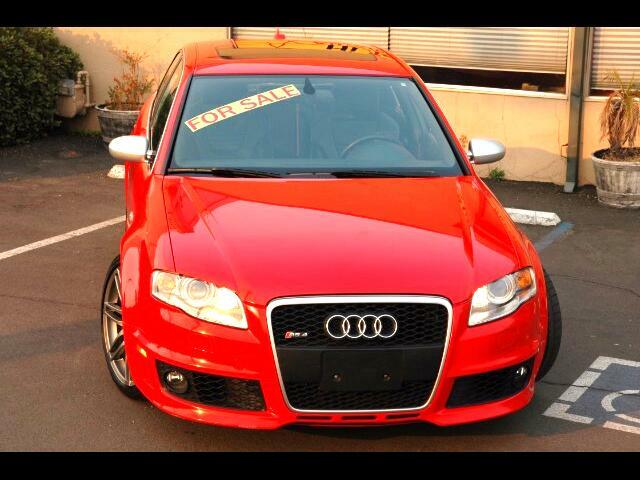 This 2007 Audi RS4 in a Misano red pearl exterior and a black leather interior, is a two owner car that has been very well cared for and maintained. It has a 4.2 liter V8 which puts out 420-hp at 7800 rpm and 317 ft-lb of torque.The RS 4 is blessed with an engine that is flexible and rev happy. That's what makes a 4.6-second 0-to-60 time possible. The RS 4 runs the quarter in 13.2 seconds at 109 mph, and that's a real measure of its potential. It was ordered with a 6-speed manual transmission that makes it very responsive especially while transitioning through the twisties or going for a blast up the coast. The current owner has elected to increase the control and dynamic of the handling of the RS4 by installing an H and R adjustable lowering suspension kit.